Lawrence from Felt once said something brilliant about how we should remember all the particular details of the day you bought a certain record. I can remember the day I bought my first Felt record. I can remember also the day I bought my first Joyce record. It was the Mr Bongo set, The Essential Joyce 1970 ­ 1996, and it was a New Year’s Eve. I’d got out of work early, and walked across Waterloo Bridge and up through Covent Garden to the Rough Trade shop in Neal’s Yard. I wanted to get something special, something a little out of the ordinary, and the Joyce compilation seemed just the thing. Mr Bongo was, and remains, one of the labels that helped fuel an interest in brazilian, afro cuban, and african sounds, and was closely aligned to London clubland and a network of DJs desperate to inform and impress, of whom Gilles Peterson was perhaps the most far reaching. I had first heard Joyce on one of the Gilles Peterson radio shows, and was struck by the irony of how someone with so seemingly prosaic a name could sound so simply beautiful yet exotic in an oddly spartan rhythmic way. And I mean Joyce rather than Gilles. It’s a funny thing with Gilles. Listening occasionally to his radio shows down the years I’ve heard lots of great things for the first time, and I’ve heard an awful lot of bland rubbish. I’ve liked him immensely at times, and at others been deeply suspicious of the way he’s so together and focused. While Gilles cites Weekend’s 'A View From Her Room' as being one of the stepping stones on his journey into jazz, we come from quite different worlds. His I guess is more of a suburban soul boy background, but there have been moments when his world has collided with mine. It was interesting watching how as the ‘80s developed the new mod generation delved deeper into the source sounds, and got heavily into dancefloor jazz just as DJs like Gilles and Baz Fe Jazz followed the legendary Paul Murphy through London’s club spaces. The ambitious and well connected Gilles in time got his own show on Radio London, and was on his way. Over the years, whether on Radio London, one of the pirates, even Jazz FM or the legalised Kiss FM, he kept sharing the music he loved, taking in the rare groove and Acid Jazz scenes, the legendary Sunday afternoon sessions at Dingwalls, and the Talkin’ Loud label itself which at least gave us Galliano and the Young Disciples as part of a possible soul renaissance. And how I’d love to spend some time in his famous Brownswood basement, digging through his crates. I could then maybe introduce him to some things he may have missed out on. 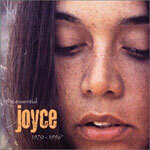 I think that Joyce track I first heard on Gilles’ show was 'Aldeia De Ogum' from her 1980 Feminina set. I like to think so, as it remains my favourite Joyce song, and Feminina itself remains Joyce’s own favourite collection of recordings. Most of the songs from her 1975 Passarinho Urbano collection come close though. Several of these songs form the heart of that Mr Bongo compilation, and their unadorned acoustic beauty, with just the occasional simple samba percussion accompaniment, is breathtaking. The songs represented Joyce’s first recorded work in a number of years and, coming at a time of repressive Brazilian politics, she used the opportunity to join the dots (to use one of Gilles’ favourite phrases) and make connections between some of Brazil’s greatest poets, outlaws, and songwriters. Earlier tracks even sound strangely like Josef K’s 'Sorry For Laughing' single, though the rhythmic inspiration for that song went little deeper than the Gibson Brothers and Ottawan, which is no bad thing. 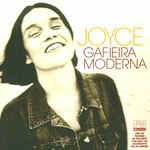 Joyce’s cover of 'Joia' may have been the first time I consciously heard the name of Caetano Veloso. If not it may have been through Arto Lindsay, of DNA and the Lounge Lizards, who then had a way of playing the guitar that rewrote the rules and excited me endlessly. Arto would retrace his Brazilian roots, and become a huge advocate of Veloso and the earlier Tropicalia movement he had been such a vital part of. Others from that same New York New Wave such as David Byrne of the Talking Heads and Lizzy Mercier Descloux would help to uncover the traces of this revolutionary period of popular culture. 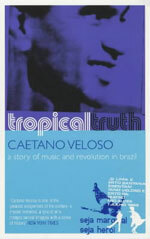 Caetano’s own account of those times, Tropical Truth, is perhaps the best document of his own music, plus others such as Gilberto Gil, Gal Costa, Tom Ze, and Os Mutantes. It’s a remarkable book, and still it gets me jumping up and down in excitement at the absolutely perfect way it too joins the dots, such as where he talks about the influence of Jean-Luc Godard on the tropicalia movement, and then suddenly switches to marvel at Mahalia Jackson singing 'Sometimes I Feel Like A Motherless Child'. The children of Marx and coca cola indeed. The political aspect of tropicalia is the most fascinating aspect of that particular revolution, and it’s hard to think of songwriters and performers having such an impact here that they would ever be banished into exile. Even the teenage Joyce was frowned heavily upon for singing the feminist words to her 'Me Disseram' on her 1968 over-orchestrated debut. The tropicalia sounds still fascinate, even if I veer more towards the melodic minimalism of Nara Leao rather than the mad mess of Os Mutantes. For as revolutionary as the Bahia tropicalia sounds undoubtedly were, they could sound forced and over-embellished, and the slightly simpler sounds of Joyce appeal more. Joyce is someone who found a new lease of life with the emergence of the UK jazz dance scene, and is treated as royalty on her regular visits. The Far Out label here, which started out by salvaging her early ‘80s Tardes Cariocas set, has steadily given her a sympathetic outlet for new recordings, which continue to be special. She has resisted the temptation to add modern electronics to her songs, preferring instead to remain true to her Carioca roots, and explore and enhance her musical heritage, by for example working with Joao Donato and Dori Caymmi, and creating bittersweet bossa numbers that work best when they’re just Joyce and her acoustic guitar. Anything else can sound too fussy.